The sky over Antarctica is now glowing electric blue with noctilucent, or night-shining, clouds. That’s according to recent images from NASA’s AIM spacecraft (Aeronomy of Ice in the Mesosphere), which monitors these clouds for the whole Earth. The season for night-shining clouds in the Southern Hemisphere is November to April, so they are right on schedule. These are ice clouds, and Earth’s highest clouds, located some 50 miles (80 km) above the ground in a layer of the atmosphere called the mesosphere. The clouds – made of ice crystals – are seeded by fine debris from disintegrating meteors. 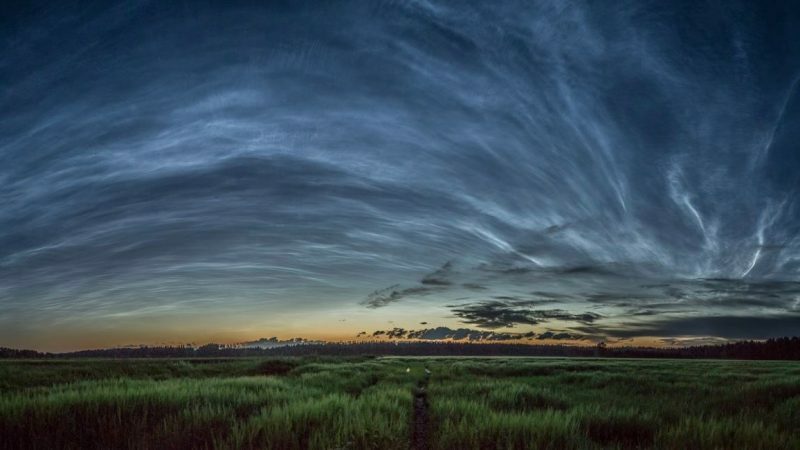 The season for noctilucent clouds in the north is May to September. In both hemispheres, they happen when it’s summertime, when water vapor wafts up into the high atmosphere, providing the moisture needed to form these spectacular ice clouds at the edge of space. As for the electric-blue glow, it comes from sunlight shining through the high clouds. Noctilucent (“night-shining”) cloud over Antarctica in early January, 2018, from NASA’s AIM satellite. The current season began on November 19. Compared to previous years of AIM data, this season seems to be fairly average, but of course one never knows what surprises lie ahead, particularly since the southern hemisphere seasons are so variable. If you were in Antarctica now, would you see these clouds shining overhead? Not likely, since there’s 24-hour daylight shining on that part of the globe now. But we’re past the December solstice, meaning that summer is waning in the Southern Hemisphere. People outside the Antarctic, at relatively high Southern Hemisphere latitudes, might be able to glimpse the clouds, especially as their sunsets come earlier and night lengthens on that part of the globe. 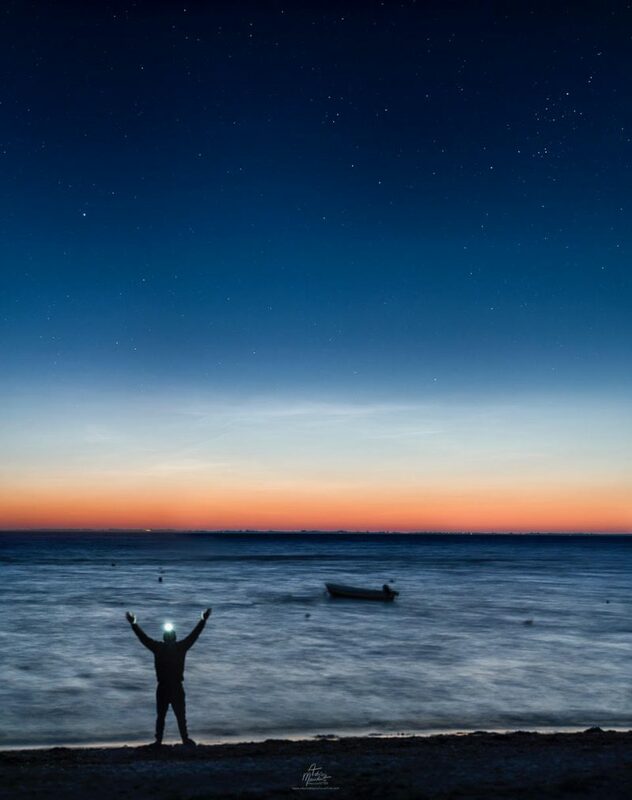 Here’s a shot of some very early-season noctilucent or night-shining clouds caught from Denmark (about 56 degrees N. latitude) on May 25, 2017 by Adrien Mauduit, at the beginning of the Northern Hemisphere’s season for these clouds. The clouds are seen at high latitudes during the summer months. There was a dazzling display of noctilucent clouds over northern Europe on the morning of July 14, 2016. Photo via our friend Jüri Voit Photography in Estonia (58 degrees N. latitude). View larger. | Here are clouds – the electric-looking clouds near the horizon in this photo – and a greenish aurora, higher in the sky, captured in June 2015 by Harlan Thomas in Alberta, Canada (about 53 degrees N. latitude). A graphic shows how methane, a greenhouse gas, boosts the abundance of water at the top of Earth’s atmosphere. 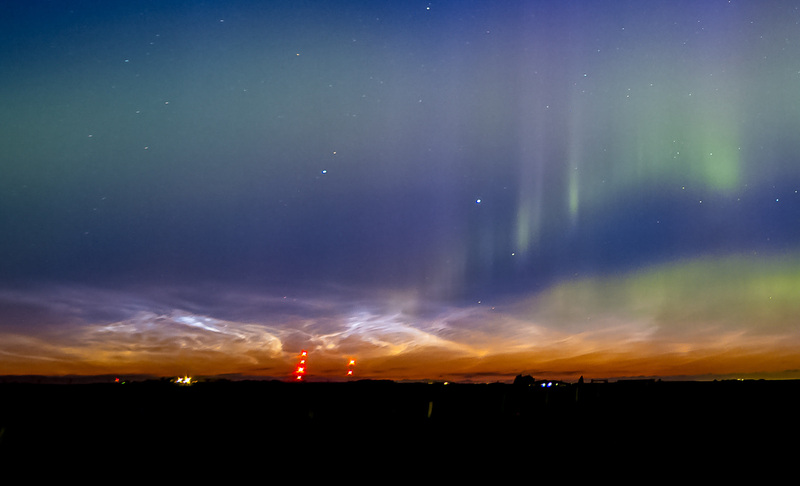 This water freezes around “meteor smoke” to form icy noctilucent clouds. Bottom line: NASA AIM image of notilucent clouds, shining in the high atmosphere, or mesosphere, over Antarctica in early January, 2018.